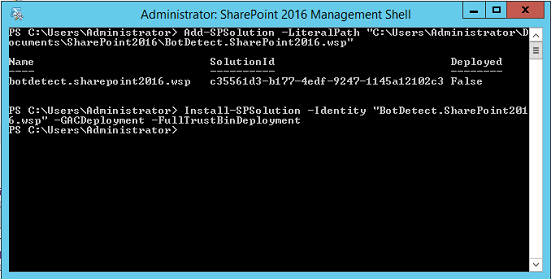 Download the zip with BotDetect.SharePoint2016.wsp file to your SharePoint 2016 server. Important: The FullTrustBinDeployment switch is necessary because BotDetect feature needs to deploy its own assembly to the GAC. If you do not add this switch, you will receive an error message and you will not be able to use BotDetect in your SharePoint environment. This is a new switch used in SharePoint 2016. 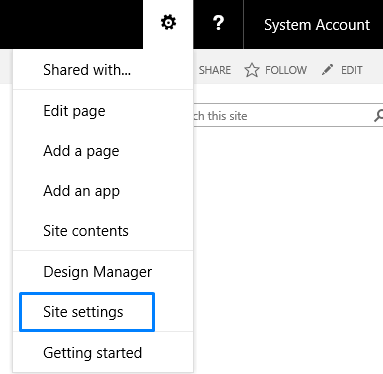 Navigate to Central Administration → Application Management → Manage web applications and select the web application in which you want to use the BotDetect SharePoint 2016 solution. From the ribbon select the Manage features option. In the Manage Web Applications Features dialog activate the SharePoint 2016 BotDetect Web Application Feature. Note: Activating the SharePoint 2016 BotDetect Web Application Feature will automatically make neccessary configuration changes in web.config of the application to support the BotDetect Captcha control. After you deploy the BotDetect SharePoint 2016 solution to your web application, the SP2016 BotDetect Field will become available for your SharePoint lists and libraries. 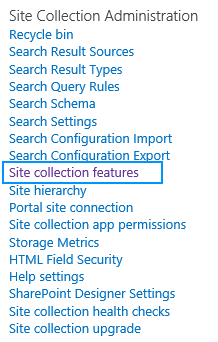 Before you are able to use the SP2016 BotDetect Field in your lists and libraries you are required to activate the SharePoint 2016 BotDetect Site Feature in the site collection where you plan to use it. Once you have activated the SharePoint 2016 BotDetect Site Feature you can use the SP2016 BotDetect Field in your SharePoint lists. 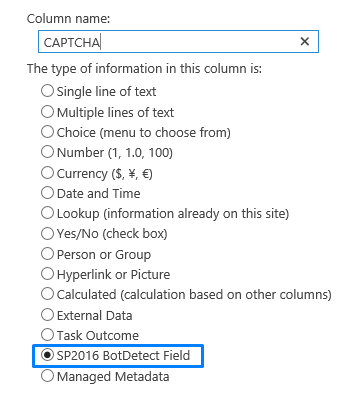 In the Create Column page simply select SP2016 BotDetect Field and enter a name. It is recommended to uncheck the Add to default view option, since this field is only relevant for Add and Edit forms. Important: In case that you did not activate the SharePoint 2016 BotDetect Site Feature, the BotDetect field will display a warning message on your forms. In case this happens, please follow the instructions to activate the SharePoint 2016 BotDetect Site Feature. Note: BotDetect SharePoint CAPTCHA Feature solution is a farm-level solution. As of SharePoint 2016, sandbox solutions are considered deprecated and as such are not supported by the BotDetect SharePoint CAPTCHA Feature.